Designer Skin Something Fierce Natural Bronzer helps nourish your skin; helps promote a more youthful look, a firmer texture, and a healthy glow. Something Fierce has essential vitamins and the formula contains brown seaweed which helps revitalize body tissue and an Ultra Conditioning Blend to promote softer, smoother skin. • Light amount of Silicone provides skin with a luxuriously smooth and soft feel. I am an avid tanner and over the years I’ve used many bronzers to try to find that perfect bronzer that would help me achieve that perfect golden tan. I’ve found that many natural bronzers just didn’t give me the instant nice looking tan I was looking for. Designer Skin Something Fierce was recommended to me by another client at the tanning salon I go to. I’ve used other products by something Fierce and have been fairly happy with the results so I was eager to try this product. As it happens the tanning salon had some samples when I went in for my appointment and I had to try it that day. I was fairly satisfied with the bronzer. The consistency of the lotion is quite thick so a little goes a long way if you apply too much it will take a little longer for your skin to absorb it. The lotion really made my skin soft but not oily and it did not streak when applied. I still recommend washing your hands after each application everyone’s skin may react differently. I am not very dark skinned so the first time I used it, it did not really give me a fabulous tan instantly like many other reviews I’ve read. I had to use it four times to notice a nice golden color and I mean golden, not orange. It was the perfect shade I was looking to achieve. I continue to use it 2 to 3 times a week at the tanning salon to keep the tan looking fresh and golden. 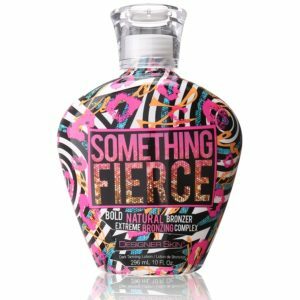 Something Fierce comes in a 10-ounce bottle that is really funky with a purple, black and white design like something from the 80’s but it’s really kind of nice and you can’t miss it if you’re looking for it at your tanning salon on the shelf. I’m not personally fond of the smell. It’s got a fruity scent, it’s a little different from most other lotions I’ve used but it’s not too overwhelming. I’m just not crazy about lotions with a fruit scent unless it’s coconut, which is my absolute favorite scent. The price at my tanning salon is a little on the expensive side running at $50 per bottle. You can definitely find this lotion at a fraction of the cost at a reputable online retailer. If you’re looking for a bronzer that gives you an instant dark tan after the first use, this isn’t for you. If you don’t mind having to wait a few sessions to achieve a really great looking golden tan that leaves your skin supple and youthful looking, then this is the bronzer for you, you won’t be disappointed. I am very pleased with the results I’ve achieved with Something Fierce and I recommend it to all of my friends and family. Remember; buy from a reputable online retailer to get a really great deal on price.